and they feel as though they will never stop ailing. each heavy and brimming with unease. and at my breast, the inaudible cry to be kept alive. sleep, swells of daylight seeping in reverie. there for the duration of this intermission. in abstinence, sober with regret that he is breakable. 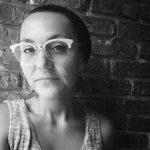 Jesse Albatrosov is an emerging poet living and writing in the Central Florida area with her husband and five children. Her work is published or forthcoming in THAT Literary Review, Black Fox Literary Magazine, Mothers Always Write, Press 53’s Prime Number Magazine and others. You can find her online at jessealbatrosov.com/ or on social media: @jalbatrosov. Featured image: Stash Eater Blanket by Brianna Mewborn. CC license.